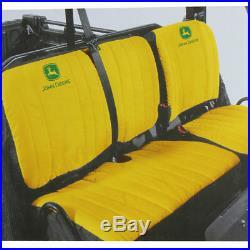 JOHN DEERE #LP68149 GATOR HD XUV 835 & 865 BENCH SEAT COVER. Protect your Gator seats from mud and stains with this yellow John Deere #LP68149 Gator HD XUV 835 & 865 Bench Seat Cover. The cover is cushioned for extra comfort, and is designed to allow easy access to seat belts. It also has an elastic hem with an east to adjust cord closure for a more custom-like fit. Made of heavy duty fabric for maximum water resistance and repellency. Fits John Deere Gator 835 and 865 HD XUV's. An Officially Licensed John Deere Product. To speed the order process, if you have both a physical street address and a separate mailing address e.
PO Box, please provide both during the checkout process, as it'll prevent any delays from us having to contact you after the fact to obtain further information to complete your order. We warrantee and represent that the goods are as described in the above listing. We specifically disclaim any implied warranties of title, merchantability, fitness for a particular purpose and non-infringement. Customers should satisfy themselves that any item choice made is suitable for their intended purpose or use. We pride ourselves on our customer service. Because of our unswerving commitment to quality and knowledgeable service, we have grown to become the largest independent hardware store in the nation. As a fourth generation family owned business, the Miller Family now employs over 650 employees throughout our various operations in the prominently Mennonite community of Hartville, Ohio. Surrounded by a mix of beautiful rolling farmland and residential areas, the town of Hartville has become a favorite tourist destination conveniently located just 10 minutes outside of Akron and 45 minutes south of Cleveland. After two years of construction, our new flagship store finally opened in April 2012. We had simply outgrown our old location and our new store at over 300,000 square feet 7 acres under roof! Is the largest hardware store of its kind in the nation. So if you're ever in the Hartville area, be sure to stop in to say hello and browse our huge selection of over 100,000 home improvement items. Don't forget to checkout our outdoor power equipment department as we're one of the largest John Deere Turf dealers in the Nation. We've got everything you could possibly want and many more items you never knew you needed. Also, not to be missed is our Hartville Kitchen Restaurant wherein you'll be served a delicious home-style meal and have the opportunity to browse our famous Hartville Collectibles store. Our restaurant is right next door to our hardware store and features our nationally recognized brand of Hartville Kitchen Salad Dressings that are homemade on-site and distributed to over 600 grocery stores throughout the nation. Give us a try and we think you'll find yourself coming back time-after-time for our great selection and outstanding customer service. Thank you for your consideration! You may also be interested in.. The item "JOHN DEERE #LP68149 GATOR HD XUV 835 & 865 BENCH SEAT COVER" is in sale since Thursday, August 9, 2018. This item is in the category "Home & Garden\Yard, Garden & Outdoor Living\Lawn Mowers\Lawn Mower Parts & Accessories". The seller is "hartvillehardware" and is located in Hartville, Ohio.